This article is about the fungi known as mold. Slime molds and water molds are not fungi and are discussed in separate articles. For other uses, see Mold (disambiguation). The frames were taken approximately 12 hours apart over a period of six days. Hyphae growing from tomato sauce. A mold (US) or mould (UK / NZ / AU / ZA / IN / CA / IE) is a fungus that grows in the form of multicellular filaments called hyphae. In contrast, fungi that can adopt a single-celled growth habit are called yeasts. Molds are a large and taxonomically diverse number of fungal species in which the growth of hyphae results in discoloration and a fuzzy appearance, especially on food. The network of these tubular branching hyphae, called a mycelium, is considered a single organism. The hyphae are generally transparent, so the mycelium appears like very fine, fluffy white threads over the surface. Cross-walls (septa) may delimit connected compartments along the hyphae, each containing one or multiple, genetically identical nuclei. 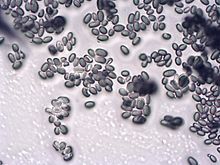 The dusty texture of many molds is caused by profuse production of asexual spores (conidia) formed by differentiation at the ends of hyphae. The mode of formation and shape of these spores is traditionally used to classify molds. Many of these spores are colored, making the fungus much more obvious to the human eye at this stage in its life-cycle. Molds are considered to be microbes and do not form a specific taxonomic or phylogenetic grouping, but can be found in the divisions Zygomycota and Ascomycota. In the past, most molds were classified within the Deuteromycota. Molds cause biodegradation of natural materials, which can be unwanted when it becomes food spoilage or damage to property. They also play important roles in biotechnology and food science in the production of various foods, beverages, antibiotics, pharmaceuticals and enzymes. Some diseases of animals and humans can be caused by certain molds: disease may result from allergic sensitivity to mold spores, from growth of pathogenic molds within the body, or from the effects of ingested or inhaled toxic compounds (mycotoxins) produced by molds. There are thousands of known species of molds, which have diverse life-styles including saprotrophs, mesophiles, psychrophiles and thermophiles and a very few opportunistic pathogens of humans. They all require moisture for growth and some live in aquatic environments. Like all fungi, molds derive energy not through photosynthesis but from the organic matter on which they live, utilising heterotrophy. Typically, molds secrete hydrolytic enzymes, mainly from the hyphal tips. These enzymes degrade complex biopolymers such as starch, cellulose and lignin into simpler substances which can be absorbed by the hyphae. In this way molds play a major role in causing decomposition of organic material, enabling the recycling of nutrients throughout ecosystems. Many molds also synthesise mycotoxins and siderophores which, together with lytic enzymes, inhibit the growth of competing microorganisms. Molds can also grow on stored food for animals and humans, making the food unpalatable or toxic and are thus a major source of food losses and illness. Many strategies for food preservation (salting, pickling, jams, bottling, freezing, drying) are to prevent or slow mold growth as well as growth of other microbes. Molds reproduce by producing large numbers of small spores, which may contain a single nucleus or be multinucleate. Mold spores can be asexual (the products of mitosis) or sexual (the products of meiosis); many species can produce both types. Some molds produce small, hydrophobic spores that are adapted for wind dispersal and may remain airborne for long periods; in some the cell walls are darkly pigmented, providing resistance to damage by ultraviolet radiation. Other mold spores have slimy sheaths and are more suited to water dispersal. Mold spores are often spherical or ovoid single cells, but can be multicellular and variously shaped. Spores may cling to clothing or fur; some are able to survive extremes of temperature and pressure. Although molds can grow on dead organic matter everywhere in nature, their presence is visible to the unaided eye only when they form large colonies. A mold colony does not consist of discrete organisms but is an interconnected network of hyphae called a mycelium. All growth occurs at hyphal tips, with cytoplasm and organelles flowing forwards as the hyphae advance over or through new food sources. Nutrients are absorbed at the hyphal tip. In artificial environments such as buildings, humidity and temperature are often stable enough to foster the growth of mold colonies, commonly seen as a downy or furry coating growing on food or other surfaces. Xerophilic molds are able to grow in relatively dry, salty, or sugary environments, where water activity (aw) is less than 0.85; other molds need more moisture. The Kōji (麹) molds are a group of Aspergillus species, notably Aspergillus oryzae, and secondarily A. sojae, that have been cultured in eastern Asia for many centuries. They are used to ferment a soybean and wheat mixture to make soybean paste and soy sauce. Koji molds break down the starch in rice, barley, sweet potatoes, etc., a process called saccharification, in the production of sake, shōchū and other distilled spirits. Koji molds are also used in the preparation of Katsuobushi. Red rice yeast is a product of the mold Monascus purpureus grown on rice, and is common in Asian diets. The yeast contains several compounds collectively known as monacolins, which are known to inhibit cholesterol synthesis. A study has shown that red rice yeast used as a dietary supplement, combined with fish oil and healthy lifestyle changes, may help reduce "bad" cholesterol as effectively as certain commercial statin drugs. Some sausages, such as salami, incorporate starter cultures of molds  to improve flavour and reduce bacterial spoilage during curing. Penicillium nalgiovense, for example, may appear as a powdery white coating on some varieties of dry-cured sausage. Alexander Fleming's accidental discovery of the antibiotic penicillin involved a Penicillium mold called Penicillium notatum (although the species identity is disputed as possibly being Penicillium chrysogenum or Penicillium rubens). Fleming continued to investigate Penicillin, showing that it could inhibit various types of bacteria found in infections and other ailments, but he was unable to produce the compound in large enough amounts necessary for production of a medicine. His work was expanded by a team at Oxford University; Clutterbuck, Lovell, and Raistrick, who began to work on the problem in 1931. This team was also unable to produce the pure compound in any large amount, and found that the purification process diminished its effectiveness and negated the anti-bacterial properties it had. Howard Florey, Ernst Chain, Norman Heatley, Edward Abraham, also all at Oxford, continued the work. They enhanced and developed the concentration technique by using organic solutions rather than water, and created the "Oxford Unit" to measure penicillin concentration within a solution. They managed to purify the solution, increasing its concentration by 45–50 times, but found that a higher concentration was possible. Experiments were conducted and the results published in 1941, though the quantities of Penicillin produced were not always high enough for the treatments required. As this was during the Second World War, Florey sought USA Government involvement. With research teams in the UK and some in the US, industrial-scale production of crystallized penicillin was developed during 1941–1944 by the USDA and by Pfizer. Several statin cholesterol-lowering drugs (such as lovastatin, from Aspergillus terreus) are derived from molds. Molds are ubiquitous, and mold spores are a common component of household and workplace dust; however, when mold spores are present in large quantities, they can present a health hazard to humans, potentially causing allergic reactions and respiratory problems. Some molds also produce mycotoxins that can pose serious health risks to humans and animals. Some studies claim that exposure to high levels of mycotoxins can lead to neurological problems and in some cases, death. Prolonged exposure, e.g. daily home exposure, may be particularly harmful. Research on the health impacts of mold has not been conclusive. The term "toxic mold" refers to molds that produce mycotoxins, such as Stachybotrys chartarum, and not to all molds in general. Mold in the home can usually be found in damp, dark or steamy areas, e.g. bathrooms, kitchens, cluttered storage areas, recently flooded areas, basement areas, plumbing spaces, areas with poor ventilation and outdoors in humid environments. Symptoms caused by mold allergy are: watery, itchy eyes; a chronic cough; headaches or migraines; difficulty breathing; rashes; tiredness; sinus problems; nasal blockage and frequent sneezing. Molds can also pose a hazard to human and animal health when they are consumed following the growth of certain mold species in stored food. Some species produce toxic secondary metabolites, collectively termed mycotoxins including aflatoxins, ochratoxins, fumonisins, trichothecenes, citrinin, and patulin. These toxic properties may be used for the benefit of humans when the toxicity is directed against other organisms; for example, penicillin adversely affects the growth of Gram-positive bacteria (e.g. Clostridium species), certain spirochetes and certain fungi. Mold growth in buildings can lead to a variety of health problems as microscopic airborne reproductive spores, analogous to tree pollen, are inhaled by building occupants. High quantities of indoor airborne spores as compared to exterior conditions are strongly suggestive of indoor mold growth. Determination of airborne spore counts is accomplished by way of an air sample, in which a specialized pump with a known flow rate is operated for a known period of time. Conducive to scientific methodology, air samples should be drawn from the affected area, a control area, and the exterior. The air sampler pump draws in air and deposits microscopic airborne particles on a culture medium. The medium is cultured in a laboratory and the fungal genus and species are determined by visual microscopic observation. Laboratory results also quantify fungal growth by way of a spore count for comparison among samples. The pump operation time was recorded and when multiplied by the operation time results in a specific volume of air obtained. Although a small volume of air is actually analyzed, common laboratory reporting techniques extrapolate the spore count data to equate the amount of spores that would be present in a cubic meter of air. Various practices can be followed to mitigate mold issues in buildings, the most important of which is to reduce moisture levels that can facilitate mold growth. Properly functioning air conditioning (AC) units are essential to controlling levels of indoor airborne fungal spores. Air filtration reduces the number of spores available for germination, especially when a High Efficiency Particulate Air (HEPA) filter is used. A properly functioning AC unit also reduces the relative humidity, or the moisture inherent in the air. The United States Environmental Protection Agency (EPA) currently recommends that relative humidity be maintained between 30% to 50% to preempt mold growth. Considering that fungal growth requires cellulose, plant fiber, as a food source, using building materials that do not contain cellulose is an effective method of preventing fungal growth. Eliminating the moisture source is the first step at fungal remediation. Removal of affected materials may also be necessary for remediation, if materials are easily replaceable and not part of the load-bearing structure. Professional drying of concealed wall cavities and enclosed spaces such as cabinet toekick spaces may be required. Post-remediation verification of moisture content and fungal growth is required for successful remediation. Many contractors perform post-remediation verification themselves, but property owners may benefit from independent verification. Various artists have used mold in various artistic fashions. 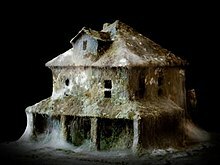 Daniele Del Nero for example constructs scale models of houses and office buildings and then induces mold to grow on them, giving them an unsettling, reclaimed-by-nature look. Stacy Levy sandblasts enlarged images of mold onto glass, then allows mold to grow in the crevasses she has made, creating a macro-micro portrait. Sam Taylor-Johnson has made a number of time-lapse films capturing the gradual decay of classically arranged still lifes. ^ a b Moore D, Robson GD, Trinci AP, eds. (2011). 21st Century Guidebook to Fungi (1st ed.). Cambridge University Press. ISBN 978-0521186957. ^ Madigan M, Martinko J, eds. (2005). Brock Biology of Microorganisms (11th ed.). Prentice Hall. ISBN 978-0-13-144329-7. OCLC 57001814. ^ Morgan, Mike. "Moulds". Microscopy UK. Retrieved 26 June 2012. ^ Chiba University, Japan. "Fungus and Actinomycetes Gallery". Chiba University Medical Mycology Research Center. Retrieved 26 June 2012. ^ Hibbett DS, Binder M, Bischoff JF, Blackwell M, Cannon PF, Eriksson OE, et al. (2007). "A higher level phylogenetic classification of the Fungi" (PDF). Mycological Research. 111 (5): 509–547. CiteSeerX 10.1.1.626.9582. doi:10.1016/j.mycres.2007.03.004. PMID 17572334. Archived from the original (PDF) on 2009-03-26. ^ a b Ryan KJ, Ray CG, eds. (2004). Sherris Medical Microbiology (4th ed.). McGraw Hill. pp. 633–8. ISBN 978-0-8385-8529-0. ^ Wareing, Peter. "The Fungal Infection of Agricultural Produce and the Production of Mycotoxins". European Mycotoxins Awareness Network. Retrieved 3 August 2013. ^ Malloch, D. (1981). Moulds : their isolation, cultivation and identification. Toronto Canada: Univ. of Toronto Press. ISBN 978-0-8020-2418-3. ^ Pitt JI, Hocking AD (2009). "Xerophiles". Fungi and Food Spoilage. London: Springer. pp. 339–355. doi:10.1007/978-0-387-92207-2_9. ISBN 978-0-387-92206-5. ^ "Red yeast rice (Monascus purpureus)". Mayo Clinic. 2009-09-01. Retrieved 2010-02-01. ^ "Study: Red Rice Yeast Helps Cut Bad Cholesterol". National Public Radio. 2008-07-01. Retrieved 2010-02-01. ^ Sunesen LO, Stahnke LH (November 2003). "Mould starter cultures for dry sausages—selection, application and effects". Meat Science. 65 (3): 935–948. doi:10.1016/S0309-1740(02)00281-4. PMID 22063673. ^ a b "The Nobel Prize website". Retrieved 27 June 2012. ^ a b c d "Award Ceremony Speech". Nobel Prizes and Laureates. Nobel Media. Retrieved 26 May 2014. ^ Gent, Janneane F; Ren, Ping; Belanger, Kathleen; Triche, Elizabeth; Bracken, Michael B; Holford, Theodore R; Leaderer, Brian P (December 2002). "Levels of household mold associated with respiratory symptoms in the first year of life in a cohort at risk for asthma". Environmental Health Perspectives. 110 (12): A781–6. doi:10.1289/ehp.021100781. ISSN 0091-6765. PMC 1241132. PMID 12460818. ^ Empting, L. D. (2009). "Neurologic and neuropsychiatric syndrome features of mold and mycotoxin exposure". Toxicology and Industrial Health. 25 (9–10): 577–81. doi:10.1177/0748233709348393. PMID 19854819. ^ Money, Nicholas (2004). Carpet Monsters and Killer Spores: A Natural History of Toxic Mold. Oxford, UK: Oxford University Press. p. 178. ISBN 978-0-19-517227-0. ^ a b Indoor Environmental Quality: Dampness and Mold in Buildings. National Institute for Occupational Safety and Health. August 1, 2008. ^ "Prestige EnviroMicrobiology, Inc". prestige-em.com. Retrieved 2018-03-26. ^ "Facts About Mold". www.aiha.org. Retrieved 2018-03-26. ^ "The Art of Mould". Discard Studies. Retrieved May 11, 2015. ^ "Still Life, 2001". Sam Taylor-Johnson. Retrieved 2017-03-23. Wikimedia Commons has media related to Mold. This page was last edited on 17 April 2019, at 10:05 (UTC).